This morning was our annual "Donuts with Dad" event at our school. Not everyone in our family likes donuts (Logan, specifically, who eats zero sweets) so daddy and the kids headed over for a delicious breakfast at McDonald's. As they were getting out of the car, kids hopping out, doors flying open, and Jackson ran smack! into the edge of the open door! And *thud* landed on his back. Blood dripped everywhere. Jeremy tried desperately to get it to stop, but head injuries like to bleed forever. He finally got things under control long enough to order the kids' food to eat in the car and head for home. What a special treat that was. As soon as they walked through the door we headed back out to the urgent care. It was quickly confirmed that, yes, Jackson needed stitches. 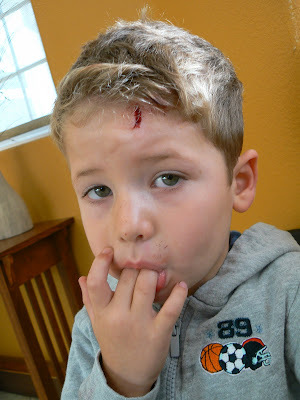 This fact may be hard to believe, but Jackson, child #4 at 4 years old, is the first of our children to need stitches. It is quite the miracle that it has taken our kids this long to be injured enough to require stitching. After checking for any sign of concussion (there were none), Jackson was mounted flat onto a child sized stretcher. Then he was wrapped up like a burrito in restraints from neck to toe. Finally, they laid a sheet over his face to keep a sterile work environment. Good grief! Talk about a claustrophobic moment! Oh how Jackson screamed when the doctor injected the needle into his wound 4 times filling it with anesthesia. Oh, my goodness! It was so painful just to watch! The doctor assured us that the relief would be almost instant. And it was. He quieted right down and doctor went to work. 2 inner stitches and 8 outer stitches later and Jackson was a free man. Look at that handiwork. The doctor has had many years to practice his stitching technique. He bragged that he'd given his own daughter stitches 21 times! "Neosporin 2 times a day and do not get those stitches wet" were our only orders. We'll be back to see the doctor on Halloween to get them removed. For now, Jackson will be happy he survived his first surgical experience especially with his new "shoot gun" from the gas station in his pocket. Didn't you know? 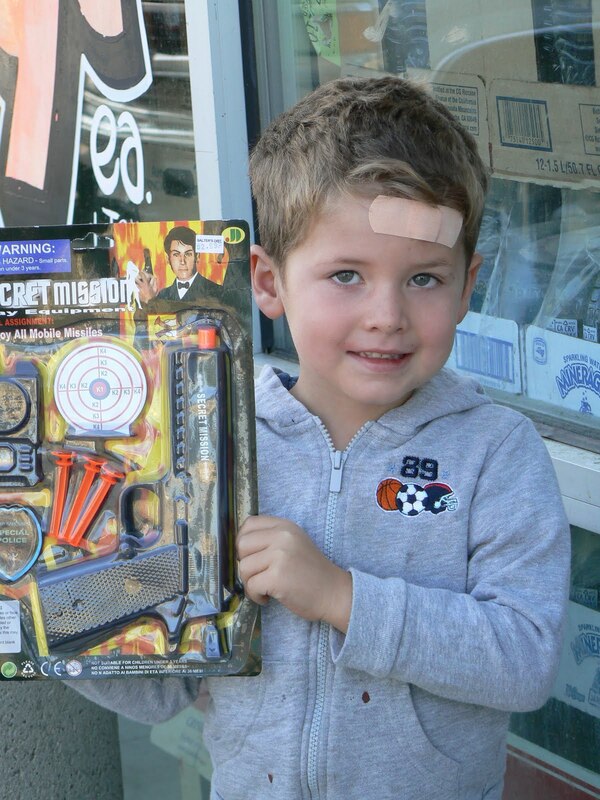 A treat from the gas station always makes everything better - even a head wound.